As Thailand’s third most-populated city, Hatyai is a robust place- full of character and charm. The local gastronomic scene is the same way. The ubiquitous Thai flavors of sweet, sour and spicy come together wonderfully with Chinese and Malay influences, creating a melting pot of flavor you can’t get anywhere else. If you’re anything like me, you probably aim to eat all you can while on vacation. After all, one of the best ways to truly experience a culture is through its food- and what better place to apply this rule than in Hatyai? Here’s a guide to all the best nibbles Hatyai has to offer, for your eating pleasure. It’s not hard to guess the main highlight of this place with a name like that. Famed for their red snapper dishes, expect to find very fresh seafood, cooked to order, and a good variety of authentic Thai dishes, from Tom Yam Kung to Som Tam. Although housed in a humble setting quite far from town (you’ll either need to drive or rent a tuk-tuk), the lower price point makes The Fish Kitchen one of the most worth-it places in Hatyai for a truly delicious local meal. The friendly staff and owner only make the experience more enjoyable! As always, go in a large group to sample more items on the menu. You might find it odd that this dish is so beloved by locals and tourists alike (chicken rice in Hatyai? Huh? Isn’t it supposed to be mango rice?). I’ll tell you why this place still manages to draw crowds. Mui Kee has been in the business for more than three decades now, and the sinfully good taste of its steamed chicken has not changed a bit. Tender and smooth, the expertly sliced pieces pair exquisitely well with the house-made sauce, which you’ll have to request for, and the rice itself is so fragrant you’ll be tempted to order another bowl halfway through your meal. Definitely a place not to be missed. If a change of scenery is required, look no further than this restaurant. Serving delectable German fare in a classy and secluded ambiance, Gäp’s Garten is famous for their wide selection of imported beers and the ever-popular German pork knuckle and schnitzel. Portions are generous, and consistently good service means a hassle-free dinner. Try the German sausage platter to taste four different kinds, and don’t forget to order the steak, beautifully done to your request. What’s certain is that you’ll want to return to try something new from the menu next time! A rare Mediterranean gem in Hatyai, the Basil boasts excellent Italian food and a monstrous wine list sure to please even the fussiest diner. Pizza lovers will adore the thin-crusted version served here, baked to perfection with generous toppings. The selection of pasta and soups also deserves special mention for their quality ingredients- this is a place where flavor and presentation merge into gorgeous dishes that look great and taste even better. The Sesame Crusted Pan-Fried Salmon is quite a mouthful (pun intended! ), but rest assured it’ll be the highlight of your meal. Simple but mouthwatering street food is the order of the day here. You’ll be genuinely spoilt for choice due to the sheer variety of food available- from fresh noodles to grilled squid to sushi! With so many options, you’ll have to watch your budget lest you get too caught up in buying packs of snacks to share (we’ve all been there). Due to the market being well-organized, roaming around is easy, but don’t expect to leave quickly- Greenway also has a mind-boggling number of stalls selling everything from clothes to pets, so you can eat and shop to your heart’s content! There’s something about having seafood with a view that makes a lunch or dinner occasion beyond special. At Bon Khao, guests will have just that. Located on a hill in Hatyai Municipal Park, you’ll be able to look out over the twinkling lights of the city as you eat. The food does not disappoint either- heartwarming Thai and Chinese dishes share pride of place at the table, while remaining affordable even for the solo traveler. Boat noodles should definitely be at the top of your must-try dishes if you’re a noodle enthusiast, and the version at Chen Long is as authentic as it gets. Each bowl is loaded with pork slices and meatballs. The dark broth is made even more glorious by adding pig’s blood and liver- essential ingredients that give that exquisite depth of flavor. To top it all off, the restaurant makes their own crackling pork skin; it’s the perfect garnish to an immensely satisfying meal. Fair warning: the portions are small here, as is tradition, so you may want to order two or three bowls per person! If you can’t get enough of pork, this place will be heaven on earth. Serving tantalizing braised and roasted pork as well as spare pork parts in soup, Ching Jie has made a name for itself among locals and tourists alike. They know their meat- each pork variation is flawlessly seasoned for a truly melt-in-the-mouth sensation. They usually sell out before noon, so come early to avoid long queues and for a great breakfast to start the day! This final recommendation is something you can’t skip while in Hatyai. If you have no time for anything else, visit this iconic market and you’ll have had a taste of Thailand. Wandering through the maze-like lanes of the market, one finds a new hawker stall around every corner, selling all manners of delicacies. From handheld snacks to proper sit-down meals, the street food experience comes to life from the early morning- with dizzying vividness and color. The Homeless Bar and Grill serves up western food, mainly of the American kind. Live music and pleasant settings make for an enjoyable meal. Order a cheeseburger and relax with friends. The menu is varied and there is much more than burgers on the menu. Try their take on the spicy chicken fajita, a pizza or nachos. The accommodating and friendly staff in this small restaurant also serve up an array of cocktails. Craft beers go well with the ribs. With fries, onion rings and barbecues, it’s the perfect place for American cuisine in a friendly atmosphere in Thailand. 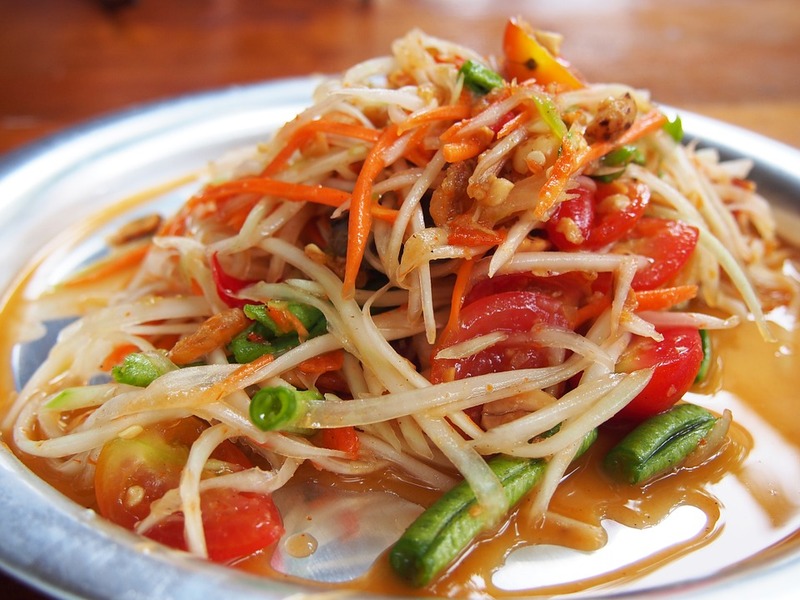 With its numerous cultural influences, Hatyai is a haven for foodies of all budgets. Give these places a try on your next trip, I hope you’ll love them as much as I did!